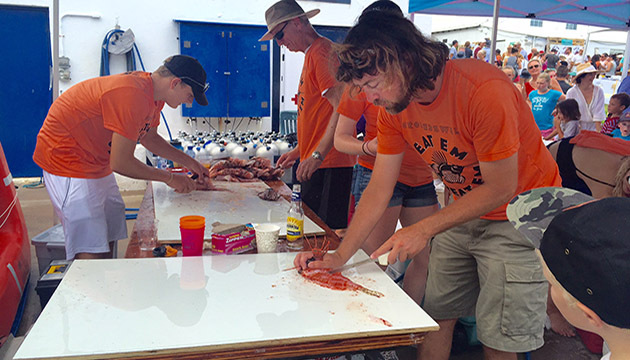 BIOS research specialist Tim Noyes prepares lionfish for biological samples and edible fillets at the 2015 Groundswell Lionfish Tournament. 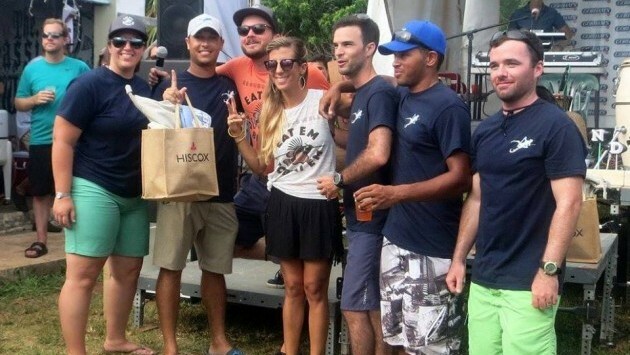 Selange Gitschner and Matthew Strong present awards at the 2016 Groundswell Lionfish Tournament. Groundswell's purpose is to create campaigns that empower the general public to positively influence, support and take part in solutions to environmental issues. Through a large volunteer base and membership, Groundswell aims to aid charities, the scientific community and stakeholders raise awareness of important environmental issues and generate community action through events, education, advocacy and cultural movements. For the past few years BIOS has hosted the annual Groundswell Lionfish Tournament, which gives individuals with lionfish culling permits the opportunity to contribute their day's catch to the tournament's total number of fish, adding to the samples available for research. The tournaments also feature educational displays by the Lionfish Taskforce, lionfish handling demonstrations, and a lionfish tasting. To learn more about Groundswell and stay up-to-date on the latest tournament information, please visit their website or check them out on Facebook.